I think this describes the new cuisine that my restaurant is focusing on. Simplicity met with elegance is key; absolute perfection must always be met in both sight and taste….always. A more sober mise-en-table, a simpler decor and an absence of excess white gloves. Perhaps a surprise to regulars of the restaurant but a new direction paves the way for initiatives and new ideas. 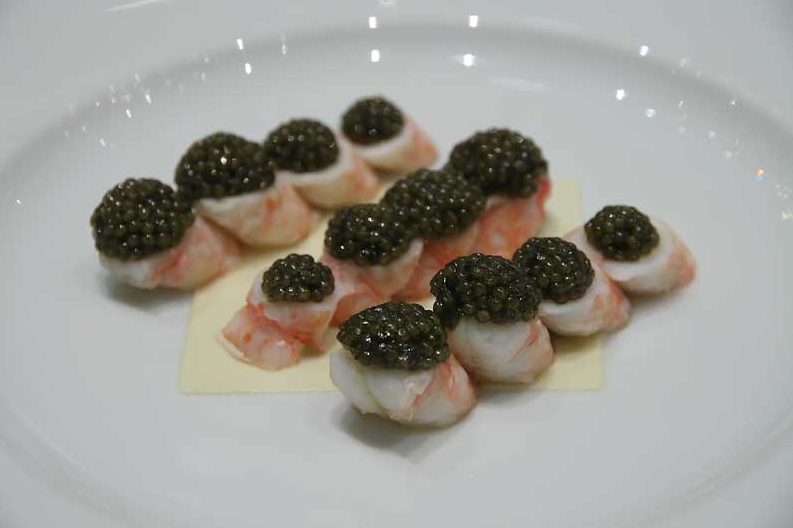 A perfect example of this new concept but surprisingly one that has stayed popular on the menu is Langoustine Caviar. What more can you ask for? The langoustines originally from Brittany are served on Langoustine cream, with a court-bouillon reduction of shellfish broth with hints of ginger and citrus at its side and topped with melon ball-shaped caviar from China. The reason why I featured this dish is because I help serve almost 40 of these at each dinner service (not including lunch). The time and effort of making this dish ‘absolutely perfect’ is quite extravagant…so is the price. First, I ask for the dishes from the service staff who have just cleaned them (they arrive in a stack of 30). The plates can only come into the station if there’s a rolled-out plastic cover on the marble so as not to scratch the bottom of the Bernardaud dishes made especially for the restaurant. I take out the freshly made langoustine cream that has been reduced to about 200 g from the many liters it started out from. The interesting thing about this cream is that it tastes like langoustine; as if you were eating it in liquid form…a weird feeling when you try it for the first time. Afterwards, I use cut out plastic shapes to put the cream in and spread the latter into the mold. This is used with a spoon to place the cream into the mold then a ruler to spread the cream so it forms (like you see above) a rectangular shape [or a square shape using a different mold in the picture below]. After all of them have been done, I wrap them in plastic film and let them harden a bit more in the fridge. Afterwards I take them out again; prepare a plastic cup filled with 2/3 white vinegar and 1/3 water that has been microwaved for 1 min and 30 seconds, take a cloth and wipe the dish. Yes, wipe. And it’s not your average general cleaning and conditioning of the dish. You must trace with your hand, the contours of the cream (making it sure it’s a perfect rectangle, or a perfect square). When the dish has been damped a little, you take the other side of the cloth and wipe it dry. But this is the part where you must pay most attention to; as there can be no sight of water condensation marks or fingerprints. It must basically be a clean mirror. On my first day at work, I obviously fumbled on a couple of dishes. Swearing at myself, as I had taken out too much cream, but I must say practice makes perfect. Another challenge is leaving no mark at all on the dish. To be sure, I rely on the light so I take the dish in my hand, raise it to the light and check every corner of every dish – I do this because once I put it on the ‘pass’ where the plates go for final critic and send off, the Chef is checking them, and better be sure that they’re perfect than have him send it back. A big No-No. Every dish has to be covered with another dish so that they do not over-dry since it’s very sensitive. After all dishes are done and filmed, they’re put in the refrigerator until service time. Now…onto the langoustines. They are cooked for a very short period of time in a bouillon, cooled immediately and de-shelled for cutting. They are all cut in four perfect slices. In 1 tray, 12 are placed together in proportion to their size and color. During service, if there is a table of two, we pick the ones with the most resemblance in color of the caviar and the langoustine. 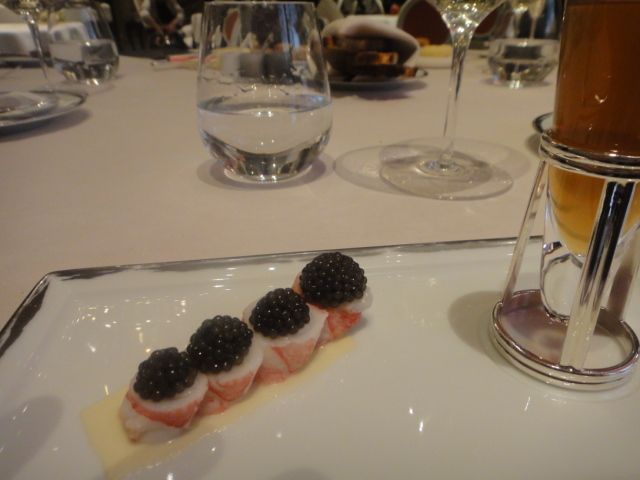 The langoustines however play a supporting role to the Caviar in this dish. The caviar is delicately placed onto the Langoustines using melon balls and a mother of pearl spoon to even out the edges. During service, when the langoustine dishes are reclaimed, I also use a toothpick to evenly put the caviar together (if need be) and make sure no bursted caviar are there. Absolute perfection – in all the sense of the words. I’m liking the new site….but I miss the high res pictures! You used to be able to click on them and see them nice and big….but not anymore 😦 can you fix that? Awesome post. This was one of my favourite; hope more like it are on the way.